Guyana’s 50th year of Independence should be seen as a tool to perpetuate national unity and Guyana’s political sphere has an important role to play in promoting such an advent. 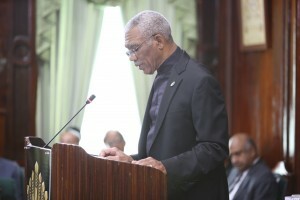 This is according to President David Granger who made the statement as he addressed Guyana’s Parliament on Thursday May 12. The President indicated that over the last 50 years the absence of National Unity has done nothing but promote strife adding that it is now time for a change. “We have a country to develop, a territory to defend and the prospect of prosperity to be pursued,” the President stated as he opened his speech in Parliament. “The absence of national unity has impaired national development it has led to the trickle of migration…it contributes to national and political fatigue,” Mr Granger added. He made it clear that the National Assembly must take the first steps on the long road to social cohesion and political inclusion. “We can construct a more cohesive society by doing more to eradicate” poverty, the President noted adding that addressing issues of gender equity and access to information.